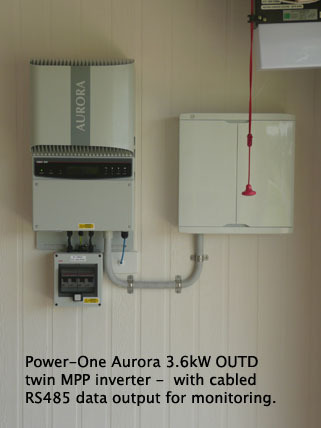 Italian made Power-One Aurora inverters. Due to the high humidity and salt air on the Sunshine coast we use IP65 inverters with heat sink cooling. SMA Sunny Boy have very high efficiency, wide DC input parameters and are able to be mounted both indoors or outdoors. They carry a 5 year warranty which can be upgraded to 5, 10, 15, 20 or 25 years for an additional charge anytime within the initial warranty period. For a truly expandable system, we recommend Power-One Aurora Inverter’s which combine the widest MPP (maximum power point tracking 90 – 580 VDC) voltage window available. They have very high efficiency, wide DC input parameters and are able to be mounted both indoors or outdoors. They are Italian made, and their Australian Distributor provides a 5 year warranty upgradeable to 10 or 12 years for an additional charge anytime within the initial warranty period. Power-One Aurora 6kW Outdoor – spec sheet (their 3.6kW, 4.2kW & 5kW inverters are very similar to this). 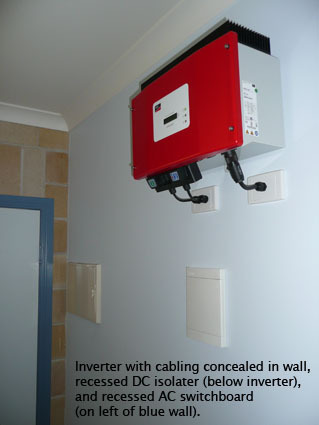 All of these inverters have an integrated LCD display panel allowing you to see energy produced and other parameters. Additional components such as remote wireless display units (which can sit on you desk) can be purchased in addition to our standard kits – see Monitoring Systems below.